One of the greatest athletes in history, Ali was a three-time world heavyweight boxing champion. He was also a compelling champion of civil rights, a protester against the Vietnam War, and a dedicated member of the Black Muslims (Nation of Islam). 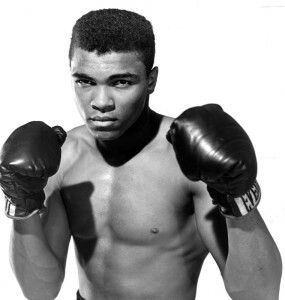 Born Cassius Clay, he was raised in Louisville, Kentucky, and encouraged by a local white police officer, Joe Martin, to train at a neighborhood gym. Clay went on to win an Olympic gold medal at age 18 (which he later renounced in protest over racism in the United States) and went on to a spectacular professional career. Influenced by Malcolm X, he converted to Islam (as a “Black Muslim”) and stirred controversy by adopting a Muslim name, Muhammad Ali. In 1966, during the Vietnam War, he refused to accept conscription in the U.S. Army and was stripped of his heavyweight title. His many supporters saw this as a bold act of civil disobedience.